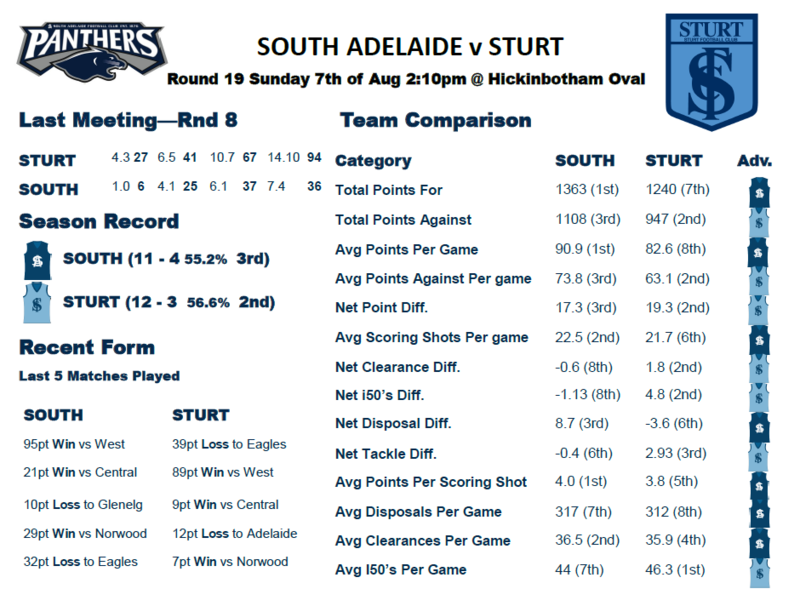 Back in Round Eight South Adelaide suffered their first loss of the season after falling 48 points short of an impressive Sturt outfit. Sturt set themselves up for a strong outing in the first quarter as they controlled the play and were the better ball moving side. In the first term, the Double Blues bombarded South's defense with 21 inside 50s while the Panthers could manage only three of their own. 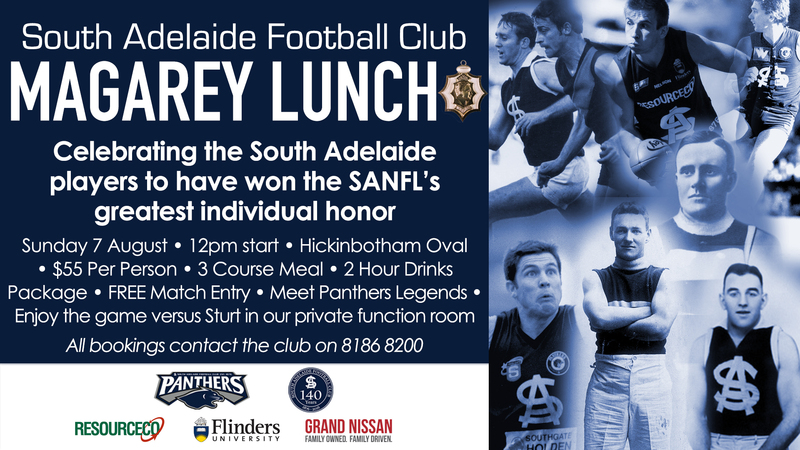 This would be the theme for most of the afternoon as Sturt enjoyed more possession (329 disposals to 271) and more forward play as they dominated inside 50s, 63 to 29. When Xavier Gotch goaled in the 18th minute of the third quarter the Blues lead was cut to 12 points and the Panthers looked poised to comeback strong as they had in previous weeks, including their barnstorming finish against the Crows in Round Six. Nic Schwarz returned from a one-week absence with a knee injury with an emphatic bang in the Reserves. The much-improved midfielder put in an exceptional performance, stuffing the stat sheet with 40 touches, eight marks, eight tackles, nine clearances, six inside 50s, two goals and two goal assists. He will be hoping that his efforts will earn him a chance to be selected in the league side this week. Otherwise, the Panthers are enjoying a relatively clean bill of health, with Ben Darrou (groin test) the only potential return in the twos. Sturt remain without the service of clearance machine Aidan Riley, who broke his hand against Adelaide in Round 15. Panthers supporters will remember Riley for his starring role in Sturt's defeat of their side earlier this season. The former Crow put in a blistering performance, collecting 26 touches (22 of them contested), 13 tackles and a whopping 15 clearances in a dominant display. The Blues will also be without West End State defender Fraser Evans, who was stretchered from the ground last weekend after suffering a knee injury against the Eagles. Keep an eye on the website on Thursday evening this week for the full teams for Sunday. Even Stevens: South and Sturt are amongst the League's best teams and are deservedly evenly matched in many categories this season. With only four rounds of football left before finals, Round 19 is sure to be exciting one, with an important clash between third-placed South Adelaide and second-placed Sturt the highlight. In their second matchup of the season, the Panthers will be hoping that returning to Hickinbotham Oval, where they remain undefeated in 2016, will help swing the result of the match back into their favour. The Double Blues are preparing for this Saturday's game after a 39-point loss to the now league-leading Eagles in Round 18. Sturt were unable to match the Eagles attack and lost the possession count by a whopping 100 disposals. 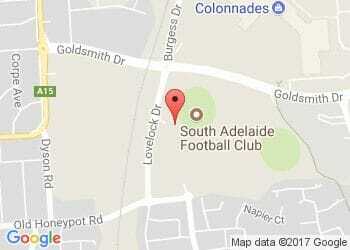 South on the other hand enjoyed a convincing win over West Adelaide, which saw them up by 95 points at the final siren. Both sides have had very strong seasons up until this point, and it shows in their major statistical rankings shown in the team comparison above. Sturt have established themselves as one of the most formidable sides at getting the ball into an attacking position, averaging a league high 46.3 inside 50s per game. Meanwhile, South continue to show dominance in points for, points per game and accuracy in front of goal, proved by their ability to get high scores on the board. When going forward, South have the luxury of the high-impact forward option of Brett Eddy, who this season has kicked a league leading 54 goals. And unlike in seasons past, Brett is also surrounded by a great supporting cast of forwards, such as Sam Overall, Rigby Barnes and the emerging Codey Ellison. Sturt also have a very strong front line, led by the League's second and third leading goal kickers in Kory Beard (38) and Mark Evans (37). The Panther backline will need to make sure they bring their best and be prepared to work as a unit to stop this damaging attacking duo. These strong offensive sides are also determined defensive units, ranked second and third in average points against showing their ability to stifle their opposition's forward forays. By all accounts the clash is sure to be a close one. South will need to focus efforts on slowing the Double Blues and not allowing them the strong advantage in inside 50s they are used to. The Panthers have secured their position in the five and are now ensured to participate in this season's finals footy at Adelaide Oval. However, in facing Sturt, South now also have an opportunity to jump into second position this week. Make sure you get out to Hickinbotham Oval and support the boys as they fight to protect home ground and attempt to remain undefeated. Remember: It isn't home advantage unless you're there!